I couldn’t have been Lilly Pulitzer in another life because…she’s still alive, but I’ve always had a soft spot for the preppy “pink-and-green” color combo Pulitzer often uses in her designs. I was initially attracted to Bond no. 9 High Line because of its pink-and-green bottle — not its juice; High Line is a type of fragrance (rather artificial, high-pitched and “Fresh!”) I usually shun, and yet…. Bond no. 9 describes High Line as “the scent of wildflowers, green grasses…and urban renewal” with “a hint of industrial grit.” High Line (perfumer: Laurent Le Guernec) was created to celebrate the “new” High Line* “neighborhood” of New York City which is: "An improbable aerial walkway lined with concrete planks and railroad tracks, landscaped with meadows, wetlands, and wildflowers, the High Line hovers 30 feet above street level as it meanders along its route from the Meatpacking District to the former 34th Street rail yards — sometimes bridging its way through buildings along the way." During High Line’s dry down, a warm/sunny “hay”-leaf fragrance note emerges (most noticeable when the perfume is sprayed on lavishly) and it makes the scent, for a short time, more unisex (I’m guessing this is the ‘bur oak’ note). The extreme dry down of High Line is very pleasant on my skin: a soft, almost powdery floral-citrus peel note coupled with lightest musk. A marine/fresh breeze accord (Calone?) wafts through the entire composition and keeps everything bright and transparent. High Line has excellent lasting power and sillage. A close perfume relative of High Line is Issey Miyake L’Eau d’Issey (but High Line is more forceful, more “up your nose” than L’Eau d’Issey). While testing High Line, I was tempted to wear green jeans and a pink shirt…but didn’t. High Line provides such a jolt of “pink and green” energy on its own — with its fluorescent rose and unripe fruit notes — that I decided it was “safer” worn with black or navy clothes! High Line’s bottle has a colorful (and textured) design of bright-green grasses and hot-pink tulips that are depicted growing through ‘railroad tracks’ (the metal plaque at the base of the bottle showing the HIGH LINE name). Bond no. 9 High Line Eau de Parfum is $220 for 100 ml and $145 for 50 ml; it’s also available in a body wash ($75/200 ml) For buying information, see the listing for Bond no. 9 under Perfume Houses. * Bond no. 9 is a sponsor of the non-profit Friends of the High Line; for more information go to www.thehighline.org. Top left pink rose image, center beetle image via Wikimedia Commons; pink-and-green Lilly Pulitzer tie, $95, via Lilly Pulitzer website. All I got from this was lawn clippings and muguet. I absolutely hated it at first sniff, and hated it a little less when I later gave it some time on my skin. But I still gave it away. I can definitely see it as one of those that would be nice on the right person, but I guess that isn’t me. 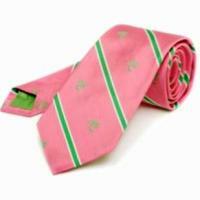 Oh– and I have an affinity for the Lily P. pink and green, too. I’m not a pink person at all (my favorite color is black, and people think I’m kidding when I say that), but there is something very sweet and happy about the color combo. I prefer a black wardrobe too! But I also like bright colors. They just don’t look good on me. I get my color fix by dressing my toddler girl in all kinds of crazy color combos – it fits her wild personality. AnnS: let the child be the wild one…good idea. Oh, gosh, I never wear black near my face if I can help it. (Spent probably 15 years singing in all black, but I couldn’t help that, it was a chorus rule. The group I sing with now is far less formal, and we wear white tops/black skirts.) I own three pairs of black pants, two black skirts, and four pairs of black shoes in varying styles, but no black tops at all. I do have a black wrap dress, but if I’m wearing that I always, always add a scarf in “my” colors – camel, spring green, terracotta, bright warm pink, tomato red, and just about any shade of teal, turquoise, or aqua. I can’t wear the preppy pink/green combo, it’s too blue to flatter me. I too am a big fan of black – purple is my favourite colour closely followed by black and teal. So most days black with some accent colour but most of my ‘colour’ comes from whatever fragrance I am wearing. I think of my perfumes’ sillage as waves of colour…wonder what colours everyone thinks their frags are? Also, I can dress my two little girls in all sort of fab colours and they look lovely! Miss K: wanted to say THANK YOU for the Ruby Beach info…we went about two weeks ago and LOVED it. Oh, yay!! I’m so glad you were able to go! It’s so beautiful. Now I want to go. It’s been probably five or six years since I was last there. LaMaroc…some TwiHards had actually written LINES OF DIALOGUE from either the books or the movies in the sand! HA! It was a wonderful day there…sunny, then COLD, then WARM, then foggy…a constant change of scene. Next time I’ll close my eyes as I drive thru Forks. Oh gawd! I thought you were going to say they wrote the lines on the rocks, as in graffiti!!! Sacre bleu! But if it’s just the sand well…I still think it’s sacriligeous but at least Mother Nature makes quick work of that. How pathetic! When I was in Paris, I wasn’t running around writing lines from “The Vampire Lestat” on the pavement. Sheesh! I read all the books before it was a damn phenom and I have four daughters that love the books and movies too so I’m bound to watch them. Silly perhaps but not pathetic surely! I love Wa. and all it’s quirky peeps since I am one of them. Oh and I loved Anne Rice’s ‘Interview with a Vampire’ book AND movie also. I wore Dzing! on my run my today in the forest , it smelled wonderful. I have to smile at some of the things we perfumistas have in commen. I wear black so often – releived by occasional outfits or brown or gray – that people tend to think I’m depressed. I’m actually quite cheerful – just monochromatic. Maggie: I hardly ever wear black…unless it’s shoes or pants…black around my face makes me look “sinister”! I like looking “sinister.” HA! I enjoy dark colors, though I’m also fond of the look khakis with a French blue shirt. An added plus is that dark colors are slimming. They really are. Joe: you know what “they” say: wearing a white shirt is a cheap facelift! I’m small, pale and plain, so bright colors and wild patterns don’t work for me at all. Most of my closet is black, navy, burgundy, beige/wheat, various blues/teals/aquas, and an occasional true red. Like Ann, I have to settle for dressing my kids in fun colors, though the teenager has hit the all-black age. Anyway… unlike most here, I do like Eau d’Issey, and I love that bottle.. maybe I’ll have to try this one after all. you’re wardrobe sounds like mine. mostly black…some dark purple, teal, royal blue, red items thrown in for accents. also white, grey, and silver. lots of dark blue jeans. i can wear bright cool-spectrum colors, but find that i just look *really really* good in black. I sort of shrug my shoulders at the idea of High Line. So really, I’m just dropping by to say HAPPY BIRTHDAY, BOO!! I hope you are having a marvelous day. hugs! Yes. I do think it’s true that as we age, black near the face becomes less and less flattering. I love black clothing myself, but have turned away from black tops in recent years. The school that I am about to go to’s colors are pink and green. Krok: get thyself a L Pulitzer tight shift and go with the flow? I think the book/gift shop sells Lilly Pulitzer purses and scarves and stuff? Or maybe that’s another designer. Bond no. 9 should have a perfume that smells like hotdogs and pretzels. Krok: pretzel and mustard for sure…mix it with some “coffee” and “amber” notes and they’ll be set. HA! every time my dad and I go to NY, we go to the same place for breakfast and I always get french toast. I totally remember the day I sampled this. I was going to meet a friend in Greenwich Village for dinner. This was just released, and I since I was going to be in the neighborhood I figured I would go to the Bond Store to try it. When I got out of the subway it was a torrential rain storm happening. I trooped up Fifth Avenue in the pouring rain to get a whiff. I tried it. Found it Soooo Fem. No prob…$ saved. I met my friend for dinner, and a few hours later I got a whiff of something real nice. Yup it was the HL. It took a long time for the FEM part to pass. Dinner was at Balthazar. Great place. I lurve the pretty bottle. Boy…I sure am flapping my mouth today. HA! C: flap away! IT takes awhile for this to de-femme on me too…but so many people asked what I was wearing on my “test” days…all really liked it. I love Balthazar..Have you ever had the Duck Sheperd Pie…it’s ridiculous!!!!!! I really want to try this Bond …. Tara: I read Carlos’ comment without my glasses at the library today and sat there for MINUTES trying to figure out how to respond to his : “I lurve the pretty hottie Boy…” I was going to write: “Is he a waiter there?” before digging out my specs and seeing my mistake!!!!!!!! I had been wanting to try this one for awhil,e mostly because the bottle is so darned cute. I finally made my way to Saks to find that the location was closing and everything was gone from the store other than one room full of clothes : ( Guess I’ll have to search it out next time I’m traveling! Odonata: seems like Bond really hit the jackpot with this bottle…got lots of people interested…. Highline reminds me a lot of AG Un Matin d’Orage. This sounds promising, and the bottle is gorgeous. It’s funny you should be reviewing a Bond no. 9 scent today, as I’ve been having a bit of bad luck with this line today – I was outbid on a bottle of Chinatown and had another bid cancelled on a sample set (look, if you don’t wanna ship to Canada, say so up front!) I’ve liked what I’ve tried from this line so far but it’s so hard to get my hands on! AmyT: where are you in Canada? These are hard to sample in the U.S. too unless one has a Saks Fifth Ave. nearby…though Nordstrom will carry them soon. Amy: I have some of the cute candy-wrapped Bond samples that I would be willing to part with. Don’t know if I have the scents you are looking for, but if you are interested, click on my name to see my e-mail address. I’d be happy to ship to Canada! Hi Kevin. “Rather artificial” (meaning, to me, *obviously* artificial) is often not a category that appeals to me, and I’ve had the problem with several Bond fragrances seeming rather and obviously artificial to me: the worst being Chez Bond, though I rather enjoy Little Italy, Silver Factory, Fire Island, and a couple of others. However, this sounds like it could be nice and makes me again curious to try it. Which L’Eau d’Issey does it resemble? Men’s or women’s? I’m surprised some materials you read call High Line a “neighborhood” rather than a “neighborhood park.” I’m still looking forward to seeing the park in warm weather some day; I always seem to be in New York in December, when the weather makes a visit not so appealing. Joe: I won’t name names but there’s “rather artificial” and then there’s “nightmare ARTIFICIAL” (and smelling CHEAP…think your neighborhood craft store candles or buy-by-the-bushel basket potpourris!) High Line does not smell cheap to me…though the pricing is up for debate…. The High Line park just might be nice in winter with the bare trees and many interesting grasses they’ve planted…and it might not be so crowded. I’ve never been attracted to Bond No 9, for a bunch o’ reasons – there are too many of them, they are expensive, they have names that convey nothing to me (I don’t know New York at all), they got nasty with The Perfume Court people … But I’m interested in the concept of artificiality being deliberately incorporated into perfume line as part of the scent, and part of the aesthetic. Does Kenzo run witih this too? And does the concept have its origins with Chanel No 5? I do like the way Bond and Kenzo incorporate the idea of urban living into their style. AnneMarie: now that you mention it, there is a similar “style” between some Kenzos and Bonds…I appreciate a little brashness every now and again…and need at least one, honking, fresh, artificial monster in the perfume line-up! HA! Yes indeed. And I get tired of all the pretense around ‘natural’ ingredients. I’m interested in smelling this-nevermind the juice, I just LOVE the bottle. Pink and green takes me back to my madras plaid shorts from the 80’s, and being a reformed preppy, the colors just speak to me. 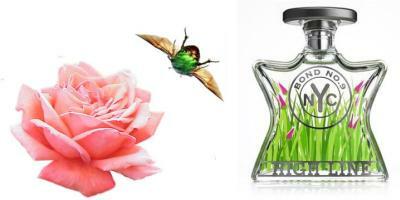 Bond No9 scents are either love or hate, the ones I love take quite a few trys to get to “FB” status. I really disliked Eau de NY and Lexington Ave before I turned the corner and started thinking of FB status. And instant loves (Coney Island), were eventually traded/swapped away. Smokey: that’s the way of the perfume world, isn’t it? I’ve had so many “why did I buy this?” moments…long before swaps were possible online. I almost bought a pair of pink and green Ralph Lauren cowboy boots ages ago…but ended up with green and canary yellow…can’t believe I wore them in NYC! It sure is-there are very few tried and true loves in my collection that were love at first sniff. Where was the internet when I first started collecting?!! I understand about the boots-have you seen 6pm’s website? They have a selection of Old Gringo boots that are in hot pink or purple. I’ve been restraining myself from clicking the “buy” button…..
was just in chicago at NM and not sure I saw this one…but I lost track when sniffing because they had so many! Elise; yes, an OUTRAGEOUS selection we have…and neroli???? Have you made a choice yet? Elise-have you tried Le Labo’s Bergamotte 22? It’s got a lovely neroli note, so does Bond No 9’s Eau de NY, both have good staying power too. I, too, think that this is the cutest bottle!! I love the colors and the design. And, the park that it is named for just sounds so wonderful–taking something that was ugly and useless and making it a garden!! sunnlitt: I use any reason to visit SF…have fun. Are you on my SF Sniff list? Email me to get on it (click on my name). Planning another trip for October. Kevin, is this anything at all like Fleur de Liane or Magnolia Romana? Those are two aquatic-like florals that I like. I like the refreshing pink and green combo, too. Pink is my favorite clothing color. Thanks for the review! Haunani: perhaps in the same family, but they smell different to me…the two you mention are smoother if I’m remembering correctly. ACk! Pink and green! I went to an Ivy school in the 80s and that color combo still makes me shriek. So did this frag….made my eyes water. It just never settled down on me and stayed bright and aggressive all the way down. I got a free sample from B#9 in the mail and gave it to a young lady I work with, who thinks it’s great. I’ve had pretty good luck with Bond until recently. Love Chinatown and Silver Factory but this one was a scrubber (and eye washer) for me. Suzanne: love the Warhol Silver Factory…but Chinatown has always ‘done me wrong’…I can’t wear it without getting a headache. Icky icky icky. That’s how I describe this scent. I only wish it smelled half has good as fresh cut grass. I don’t care if it looks like the best compliment to your polo shirts and Maybelline mascara: it stinks. To be fair, scents like High Line really don’t do it for me. When it comes to Bond, I am a Westside, Silver Factory, So New York, Nuits de Noho sort of gal. I have never understood the allure of Scent of Peace. I hate Coney Island. And I gave away all the samples I have received of High Line. Whoever said Bond No. 9’s line was love/hate was right. When I love one of their perfumes, I love it fiercely…and vice versa. SarahDactyl: no, I don’t get any cut grass at all. L’Eau d’Issey was one of the few perfumes I’ve loathed. Add a sour rose and calone to that and (pretty bottle nothwithstanding) Highline will be $$$ saved for me. Perhaps I can put those dollars towards a visit to the real Highline – which is great! Aparatchick: enjoy your stroll thru the High Line! I remember the first time I smelled this – it was a hot day, and I was lingering in a very well air conditioned Saks. I was cynical about High Line for many reasons, but went ahead and tried it. And loved it. It was so dry and grassy – I love hay notes, and the hay and dry grass notes were upfront and prominent, mingled with the mix of wildflowers and rose I associate with Newport, RI. It was fresh, like rolling hills upstate. It was near-love, but the price prevented me from taking the plunge. I smelled it again recently when I wore it out of a shop into the 95 degree heat NYC has been experiencing. And gagged. Either the heat or the humidity amplified the calone to a sickly mess, and a very sweet waxy honey musk note chased me home where I couldn’t scrub it off fast enough. Literally, it wouldn’t come off. Since then the generous folks at City Apothecary have graced me with a sample of Andy Warhol Union Square, and it has the dry-sweet floral grassy quality of Highline that I loved, but holds up surprisingly well in the heat. For now, it’s my new summer jam. Abirae: I’m so lucky to live in the NW during summer…none of that heat-humidy to worry about…perhaps five days all summer over 90. So I’ve lost the ability to gauge scents during heat spells…thank goodness. I LOVE that bottle. Love it. But I’ve run across a couple of reviews of the fragrance that call it highly artificial, and that crosses it right off my test list. So thanks for bolstering that opinion, Kevin! Another black wearer here, I always figured it was a layover from my goth teenage days. But it is slimming, and looks good with everything. And I have a very pale complexion. I also wear green, grey, browns/ neutrals, pale blue and turquoise/ aqua. Pink and green is an awesome combo, though! It reminds me of Poison Ivy, whose outfits where pink/ red and green. That movie sucked, but she does have a wicked character. I have been known to put a pink rose in an updo when wearing a nice green top or dress, for summer gatherings and parties. I tried this today and it smelled, to my nose, very much like EL Pleasures…anyone else see it? KRL: yep, I can smell a similarity in style…but to me, High Line is less feminine.